PORTUGAL (SNN) – Portugal”s Minister of Justice, Francisca Van Dunem denied India”s request to exterdite Sikh activist Paramjeet Singh Pamma who was arrested by the Interpol on December 18th of 2015 due to an Indian arrest warrant against him. Paramjeet Singh is being released from custody and will return to the United Kingdom (UK) where he has resided since 2000 after he was approved for asylum as a political refugee. Portugal”s Justice Ministry agreed that Paramjeet Singh Pamma was given refugee status by the British authorities, and was issued a valid travel document in April of 2023, which enables him to travel through several EU countries, including Portugal. The Justice Ministry stated that “The decision of the Minister of Justice falls not only in the provisions of the UN Convention on Refugees – ratified by a group of 145 countries, including Portugal and the UK – but also the Treaty on the Functioning of the EU, which provides a common asylum policy across the European Union. These sets of rules prohibit the return of the citizen who was granted refugee status in the country that was allegedly persecuted or in danger of persecution. The Indian Government had sent several Punjab Police officials to Portugal in hopes of taking him custody, they included: Rajinder Singh Sohal, Balkar Singh Sidhu, and Ashish Kapoor. 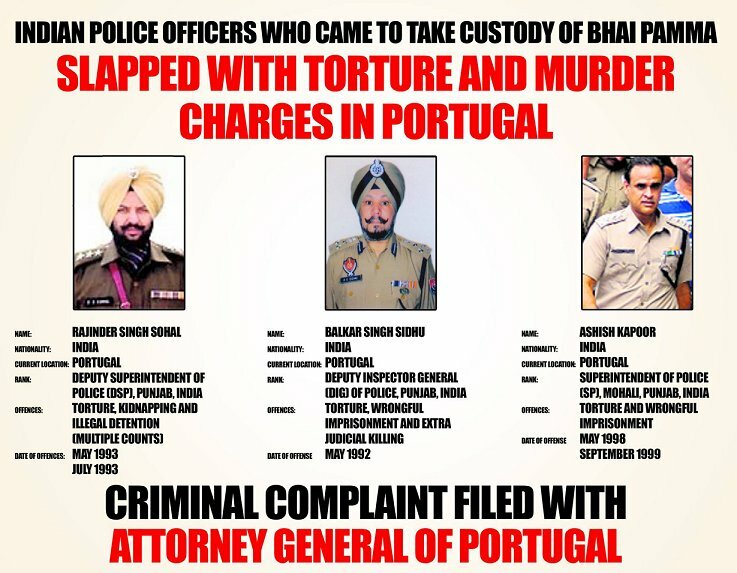 Last month, Sikh for Justice filed a criminal complaint of torture and murder charges against the three police officials in Portugal. The Sikh diaspora in Europe and North America, and various Sikh organizations, including Sikhs for Justice, along with several Members of UK”s Parliament had vocally protested and raised concern about Pamma”s arrest by Interpol and the extradition particularly since he was already residing in the UK under refugee status. It should that Paramjeet Singh Pamma”s name was also mentioned along Avtar Singh Khanda and others in an official dossier given to UK”s Prime Minister David Cameron by Narendra Modi during his visit in 2015. The dossier falsely asserted that Bhai Pamma and Bhai Khanda were radicalizing Sikh youths in the UK and providing IED training in British Gurdwaras.